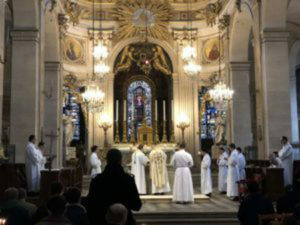 (Paris) 80 seminarians of the Archdiocese of Paris have recently attended Holy Mass in the traditional form of the Roman Rite on February 2nd, at the Feast of Candlemass. At the feast of Jesus in Templo and Purificatio Mariae, an unprecedented event took place in Paris. The Archdiocesan Seminary of Paris is the largest diocesan seminary in France. On 1 February, the seminarians attended an educational day at which they were introduced to the traditional [real] form of the Roman Rite in the Parisian church of Saint Eugène-Sainte Cecile by the priests working there, the canon lawyers Abbé Marc Guelfucci and Abbé Éric Iborra. Saint Eugène-Sainte Cecile is a parish of the Archdiocese of Paris. Both priests teach at the same time as professors at the archdiocesan seminary. The Abbot of the old ritual Benedictine monastery of Le Barroux, Dom Louis-Marie de Geyer d'Orth, then celebrated with the seminarians in the church of Saint-Louis-en-l'Île, dedicated to the French King Louis the Saint, at Holy Mass in the so-called extraordinary form, as Pope Benedict XVI. explained it in the Motu proprio Summorum Pontificum . After decades of harsh rejection and exclusion of the traditional rite, especially in France, where the intra-Church conflict was particularly marked by a strong traditionalist movement, there are signs of rapprochement. This is also evident from the fact that it was the seminarians who, in their absolute majority in the academic year 2017/2018, wanted to study the traditional form of the Roman Rite and the Motu proprio Summorum Pontificum, although, according to Corrispondenza Romana, it was not due to attempts by the diocesan authorities who had failed in the formation of priests to dissuade them. "The reality is different, and tells of a renewal of the Church, in France and elsewhere, thanks to the traditional orders and communities that attract vocations and now also attract the attention of the future diocesan clergy." The Benedictine abbey Le Barroux, from which the celebrant was called, goes back to a foundation of Dom Gerard Calvet (1927-2008). The Benedictine rejected the liturgical reform of 1969/1970 as a serious break with tradition and returned as a hermit in the French Alps. After companions joined him, he began in 1978 in Le Barroux with the construction of the monastery. He maintained close relations with the Society of St. Pius X, founded by Archbishop Marcel, but this did not follow in 1988 on the path of episcopal ordinations not permitted by Rome. He broke the link with the Society of Pius and accepted the offer of the Holy See for reconciliation. His old rite community was canonically recognized by Rome, followed in 1989 by Calvet's deference. Dom Louis-Marie de Geyer d'Orth has been the second abbot of Le Barroux since 2003. 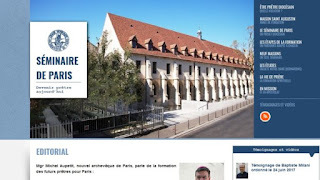 Although the seminary of the Archdiocese of Paris is the largest diocesan seminary in France, the largest seminary in the country, with more than 100 seminarians, is that of the Saint Martin Community, where, in contrast to the diocesan seminaries, the seminarians as in the seminaries of tradition, wear the cassock (vestis talaris).